Postdocs: Please contact Thorsten directly. Include with your application a brief statement on specific aspects of our research that motivated your application and the type of project(s) that would excite you. Although we value proven expertise with the approaches and/or experimental systems that we use, it is not a requirement. PhD Students: Please apply through the official Cologne Graduate School of Ageing (www.ageing-grad-school.de). Get in touch with Thorsten if you want to learn about current possibilities in the lab. MSc Students: Please contact Thorsten directly and mention which of the research topics in the lab attracted your attention. Background: Protein homeostasis (proteostasis) is achieved via conserved quality control pathways that support correct protein folding and activity. Unfortunately, the proteostasis network has a limited capacity and its impairment triggers aggregation of damaged proteins that deteriorate organismal viability. Protein aggregation in the human brain is central to neurodegeneration causing intelectual and motor deficits. By manipulating the proteostasis machinery, our team was able to delay the aging process and extend the lifespan in the nematode model C. elegans. The long-term objective of this project is to define proteostasis networks essential for stress resistance and tissue functionality. A combination of state-of-the-art techniques including (opto)-genetics, biochemical, and in vivo imaging allows us to examine stress-induced changes of protein folding and degradation pathways. The conserved regulation of proteostasis networks will be studied in C. elegans, mammalian cell culture, and samples of disease-patients. The proposed project will have broad implications for the understanding of tissue regeneration mechanisms and age-associated neurodegeneration mechanisms. Novel findings may be relevant for future therapeutic interventions against degenerative aging-associated diseases, such as Alzheimer’s, Huntington’s, and Parkinson’s disease. 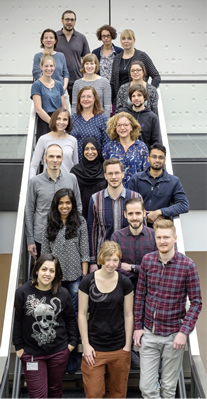 Qualifications: We are seeking a highly motivated PhD student to join our enthusiastic and collaborative group. Candidates should have demonstrated outstanding performance through their undergraduate studies. Besides creativity, a strong ability for problem solving through analytical thinking combined with an enthusiasm for scientific research is highly desirable. Additionally, we expect good communication skills, fluent English and the ability for teamwork. The successful applicant will join an enthusiastic and collaborative group where a multidisciplinary approach is pursued. How to Apply: Please send your CV, letter of intent, names and addresses of three references to Prof. Thorsten Hoppe, E-mail: thorsten.hoppe(at)uni-koeln.de.